Mani brand 11-0, black mono, nylon sutures with both single and double arms. Taper point and trape spatula needles ranging in length, curve, and diameter. Mani sutures are ideal for micro-suturing on the cornea and sclera during eye surgery. Mani brand 10-0, black mono, nylon sutures with both single and double arms. Taper point and trape spatula needles ranging in length, curve, and diameter. Mani sutures are ideal for micro-suturing on the cornea and sclera during eye surgery. Mani brand 9-0, black mono, nylon sutures with both single and double arms. Trape spatula needles ranging in length, curve, and diameter. Mani sutures are ideal for micro-suturing on the cornea and sclera during eye surgery. Ultimate sharpness is obtained through the "cross-lapped edge" technique giving each suture a fine and sharp tip ensuring minimally invasive wound closure. Mani brand 8-0, black mono, nylon sutures with both single and double arms. Trape spatula and reverse cut needles ranging in length, curve, and diameter. Mani sutures are ideal for micro-suturing on the cornea and sclera during eye surgery. Mani brand 7-0, black mono, nylon sutures with both single and double arms. Trape spatula, lancet, cut taper, and reverse cut needles ranging in length, curve, and diameter. Mani sutures are ideal for micro-suturing on the cornea and sclera during eye surgery. 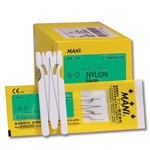 Mani brand 6-0, black mono, nylon sutures with both single and double arms. Trape spatula, lancet, cut taper, and reverse cut needles ranging in length, curve, and diameter. Mani sutures are ideal for micro-suturing on the cornea and sclera during eye surgery. Mani brand 5-0, black mono, nylon sutures with both single and double arms. Lancet, reverse cut, dia spatula, and trape spatula needles ranging in length, curve, and diameter. Mani sutures are ideal for micro-suturing on the cornea and sclera during eye surgery.